Cindy is AMAZING!!! Not only is she the nicest person you will ever meet, but her cakes are out of this world! I recently had her make my wedding cake and from the tasting to the last bite of cake on my wedding night, I was beyond impressed. She was always willing to work with my schedule, taste, budget, and vision. I plan to refer her to anyone I know who should ever need the most delicious and beautiful cakes. Thank you so much, Cindy!!! p.s. I STRONGLY encourage everyone to try her chocolate cake with cookies and cream filling and homemade buttercream frosting! SO GOOD!!! Her food also has the same quality and home-goodness... I can't wait for our guests to actually ENJOY the wedding food!! Best wedding cake I’ve ever had. Loved how our cake was decorated as well. Tasted great and the best price too! Cindy of Cinful Cuisine was such an amazing person to work with. Not only was she reasonably priced, the service she provided was above and beyond what my husband and I were hoping for! From the moment we contacted her, she was nothing but helpful and full of positive energy. Our guests are still talking about the wonderful food we had at the wedding and the wonderful service that the staff provided as well. My guests wanted for nothing and we couldn’t be happier in our decision to go with Cinful Cuisine. I would definitely recommend their services to anyone looking for a memorable catering experience at their wedding! Owner Cindy Jacobs from Cinful Cuisine is the most amazing, sweet, personal caterer around here!!!! I used Cinful Cuisine for my October 2015 wedding. When I first met Cindy for a tasting I knew right away she was the one without even tasting anything yet! I loved her personally =) she's so down to earth, I could talk to her for hours (we did lol) then after tasting her delicious food that just sealed the deal even more. On my wedding day Cindy and her staff were wonderful! They went above and beyond our expectations, when the staff delivered my husband and I our appetizers they all said congratulations and how pretty and handsome we all looked we appreciated that. Staff was wonderful with our guests very polite and courteous, answering any questions they had. My guests raved an raved over the food! so many wanted 3rds and 4ths everyone went home with full tummies wishing for more. Many have asked for her website saying they plan on using her in the future for their own events. But not only did Cindy make wonderful food she walked around making sure everything was going smooth asking if anyone needed anything, coordinating with the Dj/Photographer. My day could not have been more perfect, I owe a lot to her. My husband and I love her from the bottom of our hearts!!!!! I'm so glad that we found Cindy!! I cannot express fully how much we loved working with her. She is the best!! She helped us with so much more then just the food and cake. From, the beautiful set up of the food tables, ordering the plates/cups etc, to working with our alcohol vendor to ensure we did not over or under order or waste, she did it all Everything came out so perfect. The food was beyond words delicious! It had that "homemade" touch, so much better then the typical "reheated tasting" wedding food I've had at other weddings. We absolutely loved working with her. It was my first wedding so when the day approached, when panic started setting in, it was great to feel like that was one vendor I didn't have to worry about, I knew Cindy was on it. I can't forget to mention the cake, which Cindy also did for us. It was literally the cake of my dreams, she went above and beyond to help find a ribbon and perfect flowers to compliment our wedding colors. Go with Cinful, you will not be dissapointed!! Cindy and her staff we such a pleasure to work with! Very fun and accommodating. They went above and beyond with thier services and the food and desserts were out of this world! Cindy and her team were such a joy to work with. Her food was great! We hired Cinful Cuisine to caterer our daughters wedding at Walkers Overlook, Walkersville, MD. Cindy, the owner, was an absolute delight to work with. The food was awesome and the staff was so incredibly helpful and attentive to all our needs. The price was such a refreshing surprise. She even did homemade apple crisp and ice cream bar for dessert instead of a wedding cake, although she does those too. Cindy and Cinful Cuisine did a wonderful job making our wedding cake! She was a joy to work with- I had a great time meeting with her, going over cake designs, and trying her delicious cake samples. There were so many different and creative options to choose from, I had a tough time picking! She was also very helpful in figuring out the size of the cake I needed that would also fit in my budget. 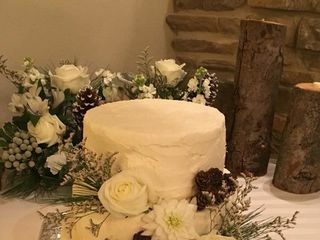 I am so glad that I took her suggestions about the size and style of the cake because the day of the wedding it was positioned behind our table and ended up in a lot of pictures! Cindy really did a great job and I was so glad to have the chance to work with her! Working with Cindy was great. She was very enthusiastic about our ideas and needs and we could tell that she really loves what she does. We were very happy with our wedding cake and my husband's groom's cake, and our guests said it was one of the best cakes they've ever had. Because Cindy uses only fresh ingredients, her cakes don't freeze well, so she meets all her couples near their 1 year anniversary to bake them a fresh cake for their 1 year celebration. We can't wait to see her again and have more of her delicious cake! We would definitely use her services again! Cindy was awesome to work with, she makes wonderful food and we got tons of compliments on the food and our wedding cake. Everything was delicious! Cindy was awesome to work with, she was very flexible and her food and cake was absolutely wonderful, if you order your wedding cake with her she will give you an anniversary cake for your first anniversary. She was wonderful. My husband and I booked Cindy less than a month before our wedding and even with it being so last minute she was extremely professional and genuinely happy for us getting married. I kind of had a vision of what I wanted but couldn't describe it very well and Cindy made recommendations to alter the vision so it would be more aesthetically pleasing. Never once did I feel like she was taking over or being disrespectful about the design. I am so glad she made the recommendations because the cake she presented us with was beautiful. It not only looked good but it tasted fantastic. My husband really wanted a different flavor than most wedding cakes and pumpkin spice with canoli filling really fit nicely into our fall themed wedding. Our guests absolutely loved the cake. We are very happy that Cindy was available for our day! Cindy is one of the sweetest people I have ever met. She legitimately cares about each and every person she works with, you're not just a dollar sign in her eyes. Better yet, her food is seriously delicious. Everything we tried from her was 10/10. When we needed to change course a bit to accommodate venue changes, Cindy totally hoped on board with us and helped us along the way. Her prices are incredibly reasonable - seriously you will not get food as good as hers for that dollar amount. She is like the 2nd mom you never had. Wonderful person! The only thing I will say is that you may need to double check details with her a few times. The flowers on my cake were not placed correctly on the day of, but it was a quick fix for the florist. That being said, it was totally delicious!